A Syrian refugee family in an informal tented settlement in Jdita town Bekaa Valley, Lebanon, where nearly 35 other families have lived for more than three years, after fleeing the war in Aleppo. 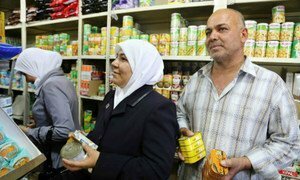 Two days after it was forced to suspend food assistance to millions of Syrian refugees due to lack of funding, the United Nations World Food Programme (WFP) announced today an ambitious fundraising campaign to drum up support and financing for its life-saving efforts in the war-ravaged country and surrounding region. “Even one dollar can make a difference. We're saying to people: 'For you, it's a dollar, for them, it's a lifeline,'” said WFP Executive Director Ertharin Cousin in a news release on the initiative. Through its 72-hour campaign, the UN agency hopes to pull in $64 million to be immediately implemented during the month of December and is urging donors and members of the public to follow the WFP's link wfp.org/forsyrianrefugees to donate online. In addition, the agency said, donors will be asked to swap their profile pictures on social media outlets such as Twitter and Facebook with a badge representing the &#82201 Dollar for Syrian Refugees” campaign. “We know that people care – and we're asking them to show it, by giving even this small amount to Syrians in need. All it takes is $1 from 64 million people,” Ms. Cousin continued. Since the Syrian conflict erupted in 2011, WFP has succeeded in meeting the food needs of both refugees and millions of displaced people inside Syria, despite the fighting and problems of access. This has been possible because of long-term donor funding for WFP operations and cooperation between WFP staff, partner organizations and host governments in the region. The agency has stressed that it is critical for this funding and cooperation to continue. A life-saving programme providing food vouchers to more than 1.7 million Syrian refugees has been suspended due to lack of funds, the United Nations World Food Programme (WFP) announced today, warning that the move will have a devastating impact on families who are already facing a dire situation as the harsh winter months approach.